The word TIME can be written in a very basic accurate way as seen in example 1. However, the word is more eye-catching and meaningful if the style of lettering / font represents the true meaning of the word. Compare example 1 and 2. 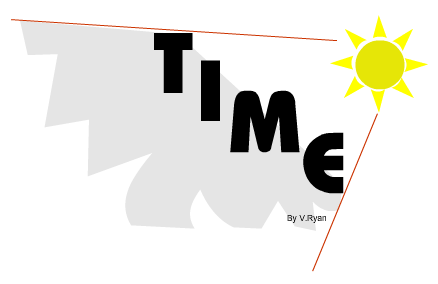 Which is the more artistic and imaginative ways of presenting the word time? explain your answer. 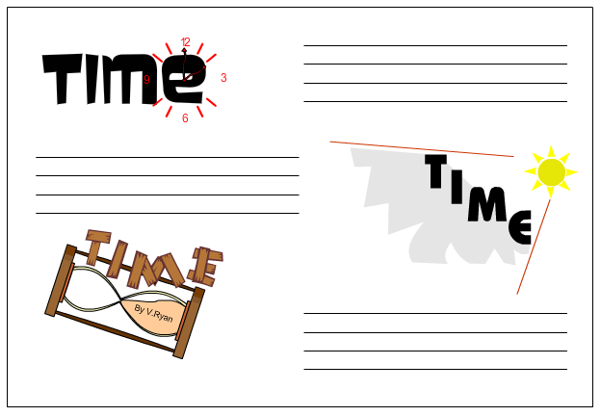 The word time is then placed with the individual letters resting on the tilted side. Each letter is written in a simple but effective style. Sand timers normally have a wooden case that holds the glass securely. This why the style of lettering is based on a wood effect. The sun has been used to tell the time since the beginning of time itself. In this example the sun casts a shadow in the same way as it would if a sundial is used to tell the time. Yellow has been used to reflect the heat and brightness of the sun whilst the grey of the lettering represents the shadow cast by the lettering. Water clocks were first introduced by the Egyptians at least two thousand years ago and sophisticated water clocks were developed in China about eight hundred years ago. The writing style opposite reflect the use of water in time keeping. Water is seen inside the ‘glass’ word. The dripping water is time seeping away. Draw three styles for the word TIME. Experiment with colour and shade. Each style must reflect the real meaning of the word. Add simple notes explaining each design. Choose your best design and draw a coloured rendered version. Explain why you consider it as your best design. An example of the layout is seen below.